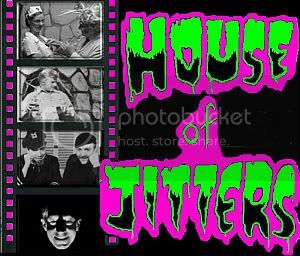 What is the House of Jitters? The House of Jitters wears many wigs. It's the name of our cobweb site, our cobweb show (coming soonish) and it's where Nurse Titters and Dr. Jitters live. It will one day be the name of our other various experiments, such as a web radio show, live performances and the like. Our first mission was to memorialize the TV heroes we grew up with in central Illinois. Check out the history of the Acri Creature Feature and The Captain Jinks show below. Click image to visit our cobweb site. Use your browser's back button to return. Dr. Jitters and Nurse Titters hang out with their little monsters and get moldy. They have fun watching old scary movies and making sweet & sour noise with the boys.